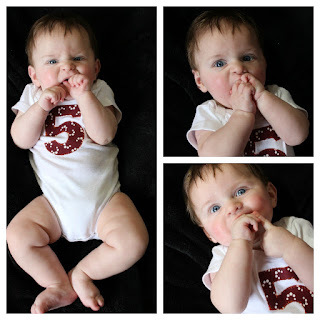 Sawyer is 5 months old! I feel like I was just writing is 4 month post (and 1 month post for that matter). My boy is so much fun these days. While I miss my snuggly newborn, I love the smiles, giggles and new discoveries. We've had a few firsts this month - our first head injury, our first cold with fever and cough, and our first day with the nanny. Fortunately, he's come through with flying colors. No doctor visit this month so we don't have "official" measurements but I would guess he's in the 18 lb range and between 26 and 27 inches. Some of our 6 month jammies are starting to get a little short in the length department. He's still mostly in 6 month clothes (Carters) but may be moving up to 9 month jammies soon. He tends to get a little belly first and then grows in length and the belly goes away. We've also moved up to size 3 diapers which is nice because they last all night (granted its about a 5 pound diaper in the morning). He's heavy enough now that its difficult to hold him for long periods of time especially in the car seat. I bought a snap and go frame to keep in my car for when we go to our parent baby class or doctors appointments. On the plus side, a heavy baby equals cool mommy biceps. Sawyer continues to be a breast milk only baby. I'm so fortunate to have such a great milk supply even after going back to work. He seems to be taking a bottle well from Andrew or our nanny Nicole. We will probably be starting solids in the next month - I've already started getting things ready including getting a high chair as well as a silicone feeder thing that I read about here. We had a minor hiccup right after our 4 month shots where he was waking up every couple of hours and busting out of the swaddle. We've since started double swaddling where we put him in the Velcro SwaddleMe, then inside the sleep sack that also has a swaddle. That seems to hold him. He goes to bed around 7:30, is usually up around 3 to eat, and then sleeps until 7 ish. His day time schedule is still a little variable but its pretty obvious when he needs to eat and when he needs to nap. I'm hoping to establish a bit more of a set routine in the next month. Sawyer likes tummy time much more (although he will still fuss if you leave him there too long). He likes his Jumperoo and Bumbo seat too. His favorite toy is his Nuby key ring (which will also be nice when he starts teething since it can go in the freezer). He laughs when you give him Eskimo kisses or if I pretend to eat his hands. He also loves to "fly". He still doesn't like getting his nose cleaned out with the snot sucker and is sometimes quite the cranky boy when he wakes up from a nap. All in all, he's a pretty content little kiddo. We take him out and about with us and he rarely fusses unless he's hungry. He likes to look at new people and things and can sleep most anywhere. I'm really having a lot of fun with him at this stage. Our nanny has started too and we love her. She does a great job taking care of our boy and its calming for me to know he's in such great hands while I'm at work. I think and hope that Nicole will be our nanny for years to come and that Sawyer and Levi (Nicole's 2 1/2 month old) will be good buddies growing up.